I'm A Guest Blogger Today at Sew We Quilt! It's a month of table runners over at Sew We Quilt blog this month, and today I'm a guest blogger there. Here is a sneak peek of the photo from the tutorial that I posted there today. I hope you will hop over to Sew We Quilt to see my post and leave a comment. My green Nearly Insane quilt is also over there on the banner for this month. 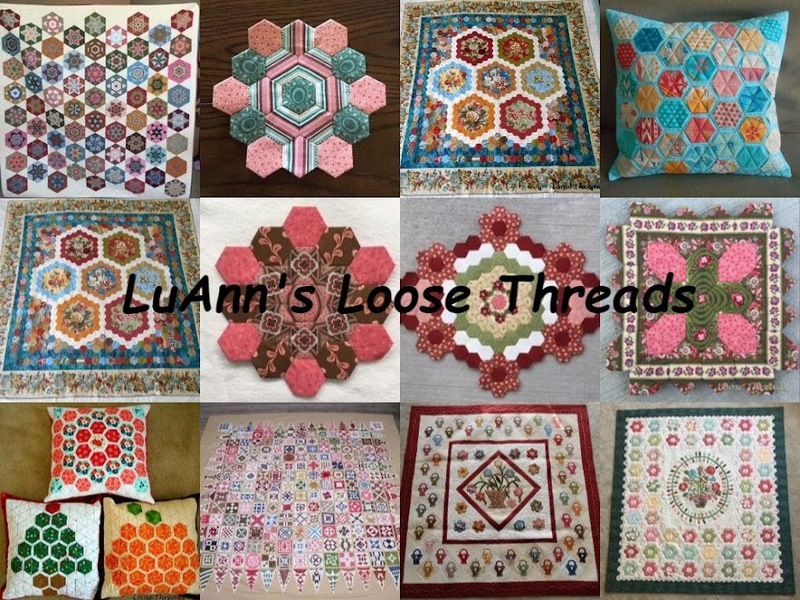 I was lucky enough to win a giveaway from Kathryn over at Needles and Pins blog. Kathryn crocheted these dishcloths, and then after I won she let me pick the trim colors. They look so fresh and springlike. Thank you Kathryn for making these for me! I love them. This is one of the trees in our back yard - a flowering crab tree. The tree in the foreground is a redbud. This is the flowering crab at the front of our home. This is my grandson, Daniel taken last Saturday at 4 days old. He's being held by Grandpa. There has been a little sewing going on here, but more on that in a couple of days. This is my grandson (and my first grandchild), Daniel Lewis born at 12:01 a.m. yesterday, March 21. He weighed in at 8# 4 oz., 21 inches long. I took this photo yesterday when he was only about 14 hours old, and then I held him for awhile. Everyone is doing fine! The weather here has been unseasonably warm, and it appears that spring is arriving early this year. I've been saving yarn and thin fabric strips to put outside for the birds to use as nest material. Here is a list of materials that I found on the Cornell University web site that are suitable for bird's nests. The container I've used is normally used to hold a suet cake for the birds to eat. I found this one in the pet aisle at my local supermarket. The magnolia tree at the corner of the house is in full bloom. I know this is called a tree, but it is really more like a bush. The flowers grow on this thick mass of twigs. The flowers don't last long; the petals are already starting to fall to the ground. I'm heading to the sewing room now to take a few stitches. I hope you are either stitching or outside enjoying the beautiful weather. I've been working on these basket blocks from When The Cold Wind Blows by Barb Adams and Alma Allen. Several of us that attend the Dear Jane retreat in Shipshewana, Indiana, started these blocks when the book was first published. Someone at the retreat thought it would be fun if we reduced the size of the blocks to finish at 3 inches. The first photo shows the ones that I made at that size. Then I decided I would make the rest of my baskets at the 5 inch size like those in the book. When I get an email from my friend Trudy she usually asks whether or not I'm working on my baskets and how many I have finished. I'm always glad when she asks about them because it motivates me to pull out some fabric and applique' a few more each time. Here are the three that I just finished. I also found these three baskets in the 3 1/2" size done in 30s fabrics. I think I'll do a few more of these and make a wall hanging. The quilt in the book has 300 baskets so I'd better get busy. I hope you are finding a few minutes to do some stitching today. I've seen all kinds of great quilts today on design wall Monday posts. Instead of quilting, I really wanted to work with the yarn that I just bought on Saturday instead. I really love Cath Kidston colors, and I tried to duplicate those in the yarn colors that I bought. If you google Cath Kidston blanket images, you will find lots of crocheted afghans in her colors. I hadn't planned to start another project, but I happened on to the Sew! Cath Kidston book at my local JoAnns store. The bag (below left) was a gift from my friend, Fiona, of Country Threads blog. Do you ever have one of those days when you know you want to do something but can't quite figure out what that is? My weekend was like that. First I made a few granny squares from the yarn. I think I need a couple more colors to go with the rest. So then I decided to knit a square. Then I remembered the Creative Knitting magazine that I just bought at the grocery has several dishcloth patterns in it. My daughter pulled out a couple balls of cotton yarn, and we each knit a dishcloth. Hers is on the left. Hopefully I will get in the quilting mood again soon, but for now I'm in a yarn mood. There were lots of vendors at the Indiana Heritage Quilt Show. I bought a few things but decided I should pace myself since I have a couple more quilting adventures planned for this spring. I bought a few pieces of Kaffe and Brandon. This group is for the shabby chic phase that I feel coming on and because I thought they were pretty. This flannel charm pack will be perfect for a baby quilt. And I bought a couple of patterns. The sample of the feathered star made the pattern hard to resist. I love the Schnibbles baskets. I'm still sewing....and sewing on Orca Bay, this years Bonnie Hunter mystery quilt. I hope to have photos soon. My friend Pam picked me up bright and early Saturday morning, and we headed south to Blooming, Indiana, to the Indiana Heritage Quilt Show. It was a beautiful day weatherwise unlike the day before when all of the tornados struck the southern part of our state. This quilt is called Letter Carriers by Janet Stone, Overland Park, KS. The ribbon is for Exemplary Machine Quilting. This quilt won ribbons for both Exemplary Hand Quilting and 2nd place in the Applique' Bed Quilt category. The maker is Betty Ekern-Suiter, Racine, AL. Love the colors on this one...2nd place pieced wall quilt. This quilt is by Birgit Schueller, Riegelsberg, Germany. Love this scrappy log cabin quilt with a great border. Quilt by Charlotte Alexander, English, IN. This quilt is called Granny Squares. Quilt by Jane Pitt, Bloomington, IN. This quilt was just interesting to look at with all of the different block backgrounds and so many designs. This quilt was made by Wendy Caton Reed of Bath, ME. This Dear Jane was made by Miriam Bruening of Oregon, IL. Love her border scallops. Beautiful applique' on this one by Mary-Margaret Morton of Ann Arbor, MI. The ribbon is for 3rd prize in Mixed and Special Techniques for Wall Quilts. The electric blue color on this quilt just glowed. This quilt won 1st place in the Applique' Wall Quilt category. Quilt by Rachel Wetzler, St. Charles, IL. This quilt by Klonda Holt of Lee's Summit, MO, won Honorable Mention in the Ensemble Wall Quilt Category. The rest of the photos from the quilt show can be found here. I'm On the March Banner of !Sew We Quilt! I'm thrilled that Madame Samm has chosen my Nearly Insane quilt as one of the four quilts featured on the March Banner at Sew We Quilt. You can read the story of my quilt in the post there today. The limes are from Diane in New York. The green with the tiny white flowers is from Hanne in Norway. This block has 229 pieces. The vegetable center is from Claire here in Indiana. I even used some 30s greens. You can read my other blog posts about this quilt. This post tells a little about the quilt and shows the finished top. I entered the quilt in the Indiana Heritage Quilt Show in 2010. Here is the post about that. You can read more about the story of my quilt at Sew We Quilt.